Looking to go on the perfect Valentines Date Night with your spouse but just need someone to look after the kids? That’s what we’re here for! 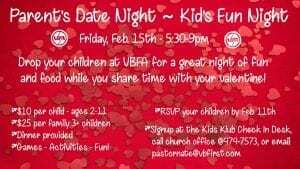 Starting at 7pm, you can drop your kids off at VBFA while you and your spouse head out for the Valentines Date that you’ve been planning for! While you’re gone, well have plenty of fun games and activities to keep your child safe and having a blast until you get back! This event is free for the community!